MK: Chauncey, I love it when you get down and dirty. CG: Work around the gooey masses of frog eggs. Remove leaves by hand in the shallows. Use the pole and net for deeper ledges. Scrape the mud and pull up soggy leaves. Throw back the salamanders. MK: Sounds like heavy lifting. CG: Compared to what? Cleaning up the muck in Washington? There are no salamanders on Capitol Hill. CG: Very fragile, but they cleanse the ponds. Ditto for snails. And goldfish to eat mosquito larvae when it gets warmer. What cleansing mechanisms are there in politics? MK: I wouldn’t know – I live in Virginia. The pols in Richmond have locked up state and congressional districts. Ten per cent victory margins are the norm. Single-party districts don’t get cleansed; they get polarized. CG: The cost of cleaning up the ponds is a couple of Advils and $29.99 for this net. What’s the price of cleaning up Washington? MK: The Supreme Court says we can’t put a price on it. CG: I’ll leave the mess in Washington to you. I hear the Republicans can’t wait to sink their teeth into the Iran nuclear deal. MK: The hard part is giving Members of Congress a say without giving them license to mug the agreement. CG: It’s been a while since I took civics class, but I still remember Constitutional checks and balances. Now it’s checks without balance. 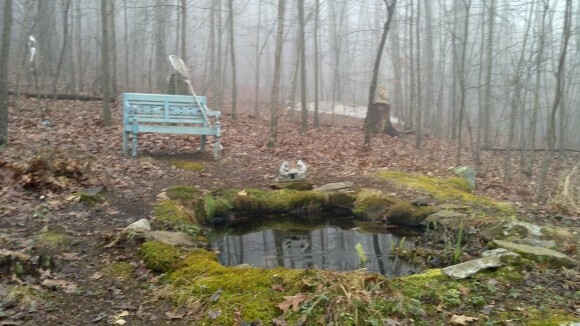 No way to keep a pond healthy. Gotta run. The moss is asking to be weeded. Congratulations for winning the Thérèse Delpech award. Yes, Congratulation! Carnegie has not yet updated its record of the recent conference. And thanks to whoever nominated me. Please reveal yourself.